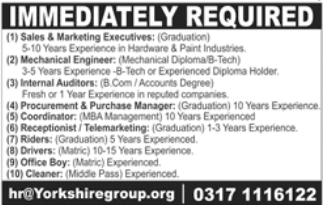 Receptionist Job is available with Yorkshire Gorup in Pakistan, Lahore. It is a Senior Level level role. This applicant should be Bachelor Degree qualified for this position. This job will expire on 06 March 2019. This job involves skills like Self-motivation,	Research skills, and Reception. Experience required is 1 to 3 Years. Self-motivation,	Research skills, and Reception.